Using Reflect Studio, we avoided assigning five engineers to build and maintain a data-visualization studio. Our business shouldn't be building a data tool; it should be building a workplace-experience tool." - Dal Adamson, product manager at workplace-experience software company Teem. Leading companies have long aspired to create value from the data they have collected. Historically, these companies either struggled to attract the necessary in-house engineering talent or traditional “business intelligence” vendors failed to help them build attractive, interactive data products. Today, Reflect launches Reflect Studio Version 2.0 (v2), the first data-visualization platform for completing the life cycle of product development: concepting a data product, leveraging a data source, iterating on the design of the product with customers, publishing into production, and measuring the results. Stats: Affectionately dubbed “meta analytics,” Stats allows Reflect users to measure how well their analytics are performing with end-users. Scopes: Personalize different visualization features, layouts or content for different segments of your audience. End-User Editing (coming soon): Allows for unmatched customization of dashboards and other visualizations by a software provider’s customers. "Using Reflect Studio, we avoided assigning five engineers to build and maintain a data-visualization studio," says Dal Adamson, product manager at workplace-experience software company Teem. "Our business shouldn't be building a data tool; it should be building a workplace-experience tool." Learn more about Teem’s journey buying versus building embedded analytics. Product managers will enjoy how easy-to-use and streamlined Reflect Studio is for creating a software application reliant upon data visualization. The drag-and-drop ease of Reflect Studio allows product managers to connect a data source (e.g., usage data from Redshift), design a set of visualizations around the data (e.g., a chart for number of users, a graph for log-ins, etc. ), iterate back and forth with key stakeholders, quickly launch the product to their customer base, and then analyze the performance. Product managers will also enjoy that the SaaS pricing is based on return-on-investment (e.g., end-users enjoying the visualizations), and not old-school, upfront licenses stuck on seats and servers. Software developers can also use Reflect Studio alongside a product manager. In addition, many software developers have come to trust Reflect’s APIs, the company’s developer product for data visualization. Reflect’s APIs extend Reflect Studio, allowing a software developer to further customize the look and feel of data visualizations and deeply integrate, or “blend in,” Reflect’s visualizations with their software user interfaces (UI). Conversely, conventional BI vendors produce an unattractive iframe that repels both software developers and everyday consumers alike. Consumers enjoy the accessibility and interactivity of Reflect’s real-time visualizations embedded natively into applications. Because Reflect doesn’t use stodgy iframes like conventional BI vendors, the data-visualization provider can create custom, tailored experiences designed with non-technical users in mind. With Reflect, even consumers with no data competency can become experts on the information at hand. 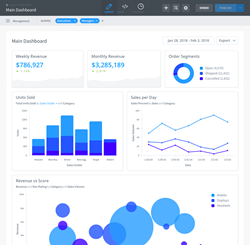 "Rather than assigning a few engineers over several months to build a data-visualization product, Reflect Studio allowed us to launch in weeks," said Chuck Fuller, principal product manager at SaaS company TUNE. "As a product manager, I like how the latest Reflect Studio makes it even easier to have a hand in the data-product development." "I'm a developer who loves Reflect's APIs, but even I enjoy the ease of using Reflect Studio to prototype different visualizations of our data," said Christian Medina Armas, big data engineer for SaaS company Osigu. "With Reflect Studio, we were able to build a completely new product that increased revenue for Osigu." Reflect is a data-visualization-as-a-service platform that helps the world better understand itself through the data it creates. Reflect Studio enables anyone to build beautiful, interactive data products without writing a line of code. And Reflect’s APIs extend Reflect’s platform for software development teams. Learn more at http://www.reflect.io.